The question is asked often: How do you select the films for your series? And there is no easy answer. I would like to tell you that we spend hours watching 30-40 films, having passionate arguments about the artistic qualifications of each film, dissect plot and character development, and then negotiate for weeks with each distributor. In reality, the process is usually fast and furious! The film world moves quickly and with the advent of streaming services, it moves faster than ever. Back in the day (as in, 5 years ago) we wanted to make sure we showed films that were not yet released on DVD. Today’s college students don’t know what a DVD is as films now hit Netflix, Amazon Prime, Hulu, or any number of streaming services quickly. In fact, many films are made to bypass theatres completely and go straight to a streaming service. As a result, our efforts to show you the latest independent and international films before you can see them anywhere else has become harder. Sometimes we see a film we would love to show, but we can see that it will be released for streaming and DVD (if they still use them) before we can show them. So, that film goes off the list! Our list gets created through a variety of ways. Some of our staff have strong connections with different distributors who suggest films for us. In addition, we watch what is happening at major film festivals (Sundance, Toronto, etc), check in with other independent theatres, take suggestions from patrons, and see what major news outlets are reviewing. We then look to create a balanced list that includes international fare as well as films from the U.S., documentaries as well as dramas as well as comedies as well as artistic entries. Once we get a list of films, we check with distributors for their input, check IMDB online, search for reviews, and watch various trailers. If we are really on the fence, a distributor might get us a “screener” that allows us to the see the film, but usually with some watermark over it so we cannot show it for free! In the end, several of us in the office review the different films and give our input. It is a good group as we approach the films with a variety of tastes, backgrounds, and expectations. Honestly alert: we are not all thrilled with every film we choose! But with some gentle arguments we usually come to find a well-rounded series. This fall series is now set and is a good example of our selection process. We open with “What Will People Say” which is a dramatic film focusing on the clash of cultures as a young Pakistani woman wrestles with her birth culture and her upbringing. From there we go to the documentary, “Love, Gilda” about Gilda Radner who was a driving force on the original Saturday Night Live. As many of you know, Radner battled an eating disorder and then died from ovarian cancer when she was just 42. Next, we go to the heart of the U.S. with “Neither Wolf, Nor Dog,” a film based on a popular novel about a white writer called by a Lakota Elder to help him write a book. We end with a Norwegian film, “Gavagai,” about a widower seeking to finish his wife’s work of translating the poetry of Tarjei Vessas, which is featured in the film. As you can see, there is a little bit of everything in there. What we love most is when we go to a film expecting to be underwhelmed, and instead walk away moved. The Knick films are not blockbusters, which certainly have their place. Instead, we seek films that challenge the viewer and make you walk away entertained and thinking. Read about all our films in our release and sign up for the free, weekly Arts Update for all the latest news. 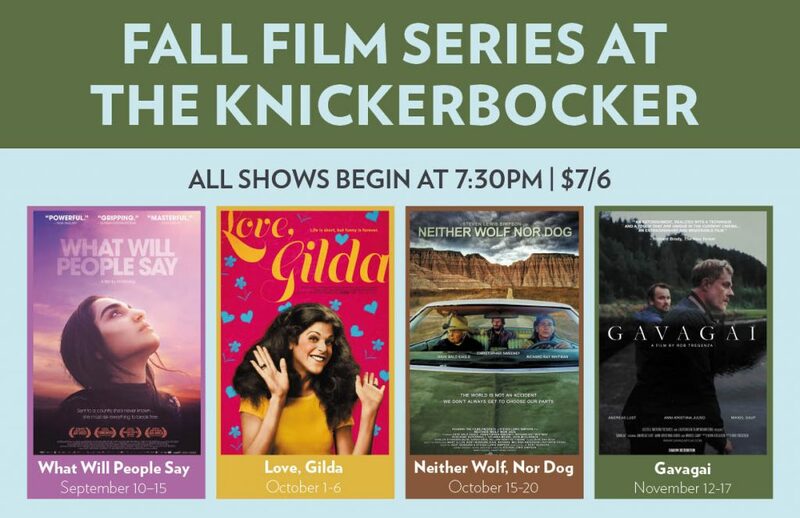 Or, visit the Knickerbocker Film Series page for trailers and information about the films. As always, thank you for supporting our series. Thanks for taking us into the inside! The films you and those you work with is such a great good gift, enriching us, broadening our understanding, engaging our aesthetic appreciation, opening our compassion. I hope you sense the gratitude of many.